Hair loss is one of the most obvious side effects of cancer treatment. Now, a growing number of breast cancer patients are freezing their scalps as a way to preserve their hair during chemotherapy. The hair-saving treatment, widely used in Europe, requires a specialized frozen cap worn tightly on the head before, during and for a couple hours after a chemotherapy session. The method can be time consuming, expensive and uncomfortable, but numerous women swear by the results. “I had the wig ready, but I never had to use it,” said Eileen Bruno, 50, of Westwood, N.J., who last year completed chemotherapy and cold cap treatment while maintaining her full head of thick, blond hair. After learning that she had early-stage breast cancer, Ms. Bruno said she worried about her health – and losing her hair. Ms. Bruno learned of the cold-cap treatment through friends, and gained the support of her doctors at the Weill Cornell Breast Center in New York, one of only a few New York hospitals that accommodate cold-cap treatment. The hospital has made space for a special medical freezer that keeps the caps ready at the right temperature, donated by the Minneapolis nonprofit group The Rapunzel Project. Patients can also stay in the infusion area after chemotherapy ends to finish the cold-cap treatment. Join the conversation: How did breast cancer change how you feel about your body? 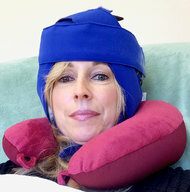 Ms. Bruno used the Penguin Cold Cap, which is essentially an ice pack fitted tightly on the head like a swim cap. The cold caps, which are rented for about $600 a month for a set of caps, must be kept frozen and changed quickly every half-hour. Many women enlist friends or family members to help them quickly change and refreeze the caps as needed. Some patients hire “cappers” to help, paying $300 to $750 a day for the service. Another scalp cooling system, called the DigniCap, is less labor intensive. It uses a small machine and tubes filled with a coolant to chill the cap. Researchers at the University of California, San Francisco, and several other medical centers around the country recently completed a pilot study and clinical trial in 120 patients. U.C.S.F. also monitored about 100 women who used the Penguin cap. The results have not been published, but both studies showed that most women who used a scalp-cooling cap kept most of their hair, said Dr. Hope Rugo, the director of breast oncology at U.C.S.F., who led the research. Dr. Rugo said the DigniCap may soon become the first scalp-cooling device to be approved by the Food and Drug Administration, a move that would increase the likelihood of insurance reimbursement and make them more widely available. “It’s so important for people to know we may have an F.D.A.-approved device in the near future,” she said. Cold cap treatment is not typically covered by insurance, although doctors tell stories of women winning reimbursement in lieu of wig costs. The cost varies depending on the duration of chemotherapy and the type of cap used, but doctors estimate that the average cost of a scalp-cooling treatment is about $2,000 a patient. Wendy Brown, 59, was found to have breast cancer last year and learned of the DigniCap study from Dr. Rugo, her oncologist. She said using the cap created brief moments of discomfort, and it had to be worn for two additional hours after her chemotherapy ended. Other than that, she described the cap as “goofy” and a source of amusement among her friends, who manipulated photographs of her wearing the cap to make it look as if she were scuba diving or piloting a Red Baron-style airplane like the cartoon character Snoopy. A surprising benefit of keeping her hair was privacy. Women who have used the Penguin cold caps say they can be heavy and the first few minutes of freezing can be excruciating. They wrap themselves in electric blankets, socks and sweaters to endure the treatment, which is given concurrently with chemotherapy and generally adds a few hours of treatment to a chemo session. The scalp-cooling treatment is believed to work in two ways. By reducing the temperature of the head, the cap slows down the metabolic activity of the follicular cells in the hair, reducing the effects of chemotherapy on scalp hair. “If you put the hair follicle to sleep a bit it won’t be as sensitive to the effect of chemotherapy,” Dr. Rugo said. The cap may also have an effect by constricting blood vessels to limit the amount of chemotherapy that penetrates the scalp. This has led to some concern that cold-cap users could theoretically be at risk for their cancer to metastasize to the scalp. However, doctors say scalp metastasis is incredibly rare, and with the cold caps widely used in Europe, doctors there have not detected a rise in cancer spreading to the scalp area. Women who use the caps say they know the caps are working because they begin to lose all their other body hair, but only have mild thinning of their scalp hair that is not noticeable to most people. During treatment, patients are advised to be gentle with their hair, avoiding blow drying and heat treatments, coloring or frequent washing. Dr. Tessa Cigler, a Weill Cornell oncologist involved in the cold-cap studies, said she first learned about cold caps from a patient who had researched the treatment and learned about their use in Europe. After studying the European data on cold-cap treatment, she allowed her patient to use them and became interested in conducting her own research. The success of a cold cap treatment often depends on the duration and type of chemotherapy regimen, so not every woman is a candidate, Dr. Cigler says. In addition, cold caps are typically used only on patients with solid tumors, like breast cancer, and are not suitable for patients with blood cancers. This entry was posted in Cancer, Cryoablation, Kidney Cancer, Magnetic resonance imaging, Surgery, Tumour and tagged Breast cancer, Cancer and Hairloss, Chemo Sideeffects, Cold Cap, Eileen Bruno, GL-W, Greg Lance-Watkins, Greg_L-W, Hair, Hair Loss. Bookmark the permalink.